HST/ACS image of Andromeda IV in F606W filter. The image size is 1.6 × 1.5 arcmin. A box of 40′′× 50′′centered on Andromeda IV is shown. A box selected for the M31 halo population accounting is situated at the WFC1 chip about 2 arcmin outside the Andromeda IV center. Credit: Karachentsev et al. 2015. (Phys.org)—Andromeda IV, discovered in 1972 by Canadian astronomer Sidney Van den Berghan, is believed to be an irregular satellite of our neighboring Andromeda galaxy, also known as Messier 31. Now, a new study conducted by an international team of scientists led by Igor Karachentsev of the Special Astrophysical Observatory in Nizhnij Arkhyz, Russia, tells a different story regarding Andromeda IV's true nature. The study, published online on Dec. 18 in the arXiv pre-print server, indicates that the object of interest is a gas-abundant solitary irregular dwarf galaxy. The researchers analyzed the data provided by observations with the Advanced Camera for Surveys (ACS) installed on the Hubble Space Telescope. ACS, designed to obtain sharp images of deep space, sees in wavelengths from the far ultraviolet to visible light, which enables studying some of the earliest activity in the universe. Karachentsev and his colleagues focused on the observations conducted in August 2014, using the ACS instrument. These data helped to acquire crucial information regarding the galaxy's distance and its surface brightness. The new study estimates that Andromeda IV is located approximately 22 to 24 million light years away. Previous observations were less accurate, calculating the distance to be from 16 to 26 million light years. According to the research, the galaxy has a total blue absolute magnitude of –12.81 mag. "To measure total galaxy magnitude in each band, the galaxy image was first fitted with concentric ellipses. Then integrated photometry was performed in these ellipses with parameters defined from the center to the faint outskirts. The total magnitude was then estimated as the asymptotic value of the radial growth curve," the researchers noted. The scientists also used the results from the Giant Metrewave Radio Telescope (GMRT) in India. Analyzing observations provided by this array of radio telescopes, they were able to derive Andromeda IV's rotation curve for the 21 centimeter hydrogen line (an electromagnetic radiation spectral line created by a change in the energy state of neutral hydrogen atoms) and fit it with different mass models. "The galaxy was modelled as consisting of three components, a stellar disk, a gas disk and dark matter halo. The structural parameters of the stellar disk were fixed using the photometry in I-band," the astronomers wrote in the paper. The Andromeda IV system resides in a region of low spatial density by number of galaxies. According to the research team, the mean density of stellar matter in a sphere of 3.26 million light years radius around this system consists of 0.04 of the mean cosmic stellar density, which indicates the severe isolation Andromeda IV. The astronomers were also able to detect the presence of a significant amount of neutral hydrogen, a moderate activity of star formation and a low metallicity at Andromeda IV. They conclude that these are typical features of isolated dwarf irregular galaxies and such gas-dominated objects must be at an initial stage of their evolution. Andromeda IV could be similar to Local Group dwarf galaxies such as IC 1613 and Sextans A. "The galaxies with high gas-to-stellar mass ratio are usually isolated objects, with a low optical surface brightness and low metallicity," the scientists wrote. 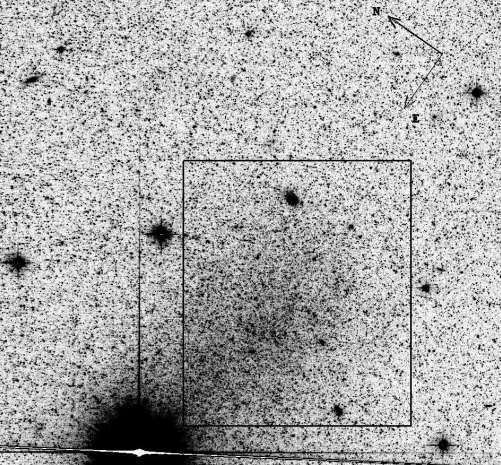 Observations are presented of the isolated dwarf irregular galaxy And IV made with the Hubble Space Telescope Advanced Camera for Surveys and the Giant Metrewave Radio Telescope in the 21 cm HI line. We determine the galaxy distance of 7.17±0.31 Mpc using the Tip of Red Giant Branch method. The galaxy has a total blue absolute magnitude of -12.81 mag, linear Holmberg diameter of 1.88 kpc and an HI-disk extending to 8.4 times the optical Holmberg radius. The HI mass-to-blue luminosity ratio for And IV amounts 12.9 M⊙/L⊙. From the GMRT data we derive the rotation curve for the HI and fit it with different mass models. We find that the data are significantly better fit with an iso-thermal dark matter halo, than by an NFW halo. We also find that MOND rotation curve provides a very poor fit to the data. The fact that the iso-thermal dark matter halo provides the best fit to the data supports models in which star formation feedback results in the formation of a dark matter core in dwarf galaxies. The total mass-to-blue luminosity ratio of 162 M⊙/L⊙ makes And IV among the darkest dIrr galaxies known. However, its baryonic-to-dark mass ratio (Mgas+M∗)/MT=0.11 is close to the average cosmic baryon fraction, 0.15. No distance estimate is listed on wikipedia, so probably distance estimates are very recent. That should have been pointed out in the article, without it the title does indeed not make sense. When we talk about members of the Local Group, we're talking about an area 5 million light years across. By the time you get to 9 million ly you're into the M94 Group and Maffei Group, and above 10 million ly there are members of the the Centaurus and M81 groups. Ultimately, group membership has to do with its proper motion, so I'd like to see Hipparcos satellite data on the object. Saying it's a gas rich loner is more a statement of its origins than its current place in the cosmos. Is it gravitationally bound to one of the local groups? A good example of a comparable galaxy would be Sextans A, at least by their description, but that's only 4 million ly away...and considered to be a distant local member. If you're saying it's a satellite of Andromeda, then you're saying it's a local group member. It's neither. The paper makes a lot more sense than the ham fisted writing in the article.